We’re pleased to announce a new version of the Smartbar extension (V7.0). The Smartbar supports the latest five versions of Google Chrome, so after this release, only Chrome version 62 or above will be supported. Please note that this means that the extension will no longer update if it is already installed and the Chrome browser version is lower than 62. 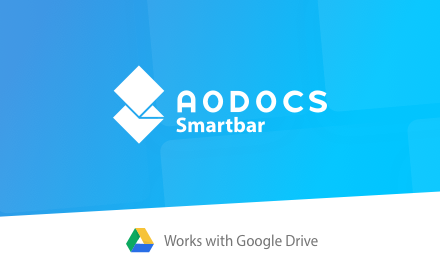 Previously you whitelisted https://storage.googleapis.com/smartbar-config to access the Smartbar Google Cloud Storage (GCS) bucket in the AODocs project. We modified this bucket: it’s now in a dedicated Smartbar project. We’ve also improved the behavior of the Smartbar in Grid mode. You can now use the features from the file preview instead of switching systematically to the list view. Note: Currently, we don’t support navigation in the Google file preview. If you want to manage several files from the preview you have to open them one by one. 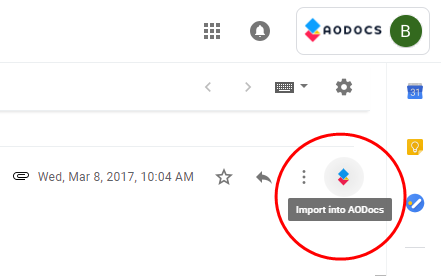 As many of you are now using the new Gmail interface, we adapted the Smartbar features to be compatible with the two interfaces. To be consistent with the new AODocs graphical charter that appeared in release 46, we’ve updated the Smartbar logo and assets. Display the breadcrumb and the list of attachments for Document Management libraries in the file preview. Version 7.0 will be rolling out on 11 June 2018.